She’s one of the most easily recognized artists of the twentieth century. 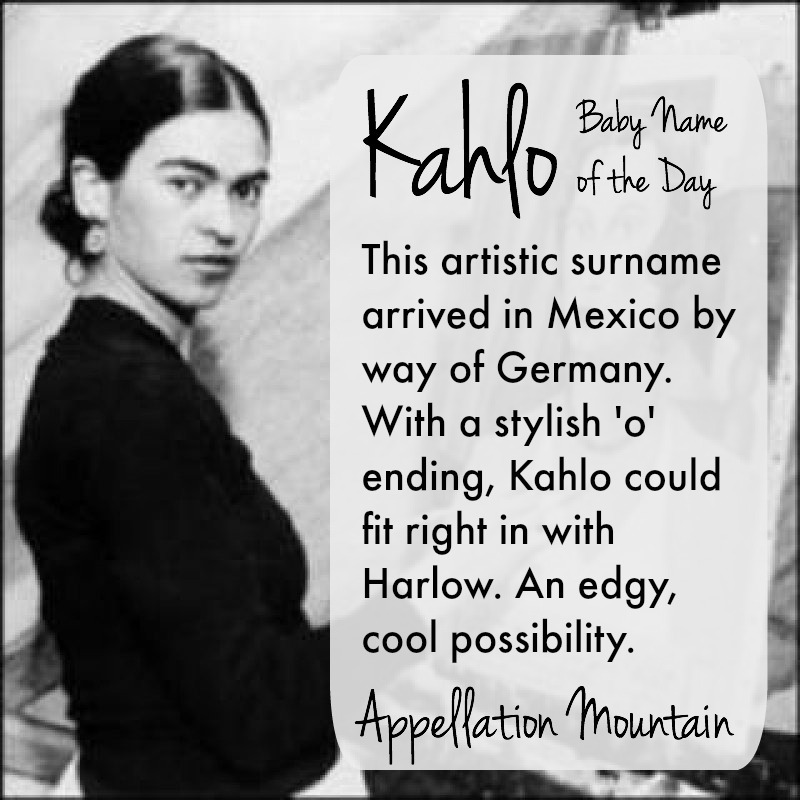 Artist name week continues with Kahlo as our Baby Name of the Day. Frida Kahlo was born in Mexico City in 1907. Her father had come to Mexico from Germany in 1891. He promptly shed his birth name, Carl Wilhelm, for the Spanish Guillermo. Kahlo doesn’t feel especially German to me, but indeed, it was Guillermo’s birth name, retained unaltered in his new country. Kahlo took up painting after an accident left her to a long, lonely convalescence when she was a teenager. Her artwork, including her famous self-portraits, reflect her mother’s heritage – a mix of Mexican and Amerindian cultures. Part-folk art, part-surrealism, and with a heavy focus on self-portraits, her work is unmistakable. Kahlo is also for her tempestuous marriage to fellow artist Diego Rivera. Salma Hayek was nominated for an Oscar for her 2002 portrayal of the artist in Frida. Hayek didn’t just play Kahlo in the movie – she was instrumental in getting the movie made, and the role took her from an unknown to a major star. The success of Frida means that this generation of parents almost certainly recognizes the artist and knows something of her extraordinary story. So where did the surname Kahlo come from, and what does it mean? My best guess is that it comes from Kahl, a German surname that comes from the word kal – bald. But I’m really guessing. While Carl Wilhelm wasn’t the only German with that surname – and others can found in the US – it doesn’t seem to be common anywhere, and I can’t explain the spelling. Frida liked to say that Guillermo was descended from Hungarian Jews, something that’s repeated in more than one biography. But more recent scholarship suggests that it’s not the case. So it cannot explain the family’s unusual surname. 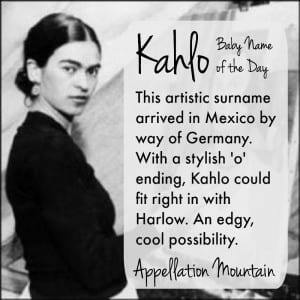 At first glance, Kahlo is a strange name to feature as a Baby Name of the Day post. It’s never cracked the US Top 1000. The peak year for this name was 2009, when a grand total of five boys were called Kahlo. 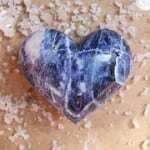 Thanks in part to Frida, the artist is a household name. This makes Kahlo the perfect marriage of rare and recognizable. If the name isn’t instantly understood, saying “Kahlo, like the artist,” will probably help most people remember the name. We’re wild for ends-in-o names for boys and girls, from vintage choices like Margot and Leo to newer possibilities. If Willow can be mainstream, why not Kahlo? Despite the name’s German roots, it feels like a great nod to Mexican heritage, or just a distinctive crossover name for a Spanish/English speaking family. The name is so strongly associated with a female artist, one often considered a feminist icon. 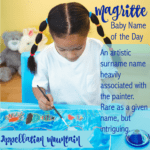 While there’s no reason girls can’t be named after John Lennon or other male heroes, there’s something appealing about using the name of a famous female artist for a daughter. On a more practical note, we’re embracing ends-in-o surname names for girls at the moment. If Harlow, Marlowe, and Monroe are all currently stylish picks for a daughter, then Kahlo fits right in. 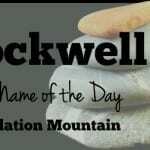 Overall, this name is rare, and has a bold, daring style. But it might wear surprisingly well for a child in 2015. What do you think of Kahlo? 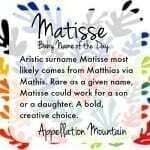 Do you think it works as a given name? Is it better for a boy or a girl? I named my son Kahlo! Frida is my favorite artist and I couldn’t be happier with my choice to name him after her! that puts me of the name is it sounds like the word callow. I don’t like the artist much, so that puts me off the name. It also sounds masculine to me. When I say Frida my first thought goes to Frida Kahlo. So I guess I’d never feel the need for something more specific. It sounds masculine to me and I don’t see benefit over Carlo. I don’t know the artist though. Love the artist, but I would use Frida for a namesake. I am not sold on the -o names in general.